The Winter Fundraising Event is part FCCAN’s overall fundraising and fiscal strategy that ensures that progressive action and social justice within our community is kept alive. 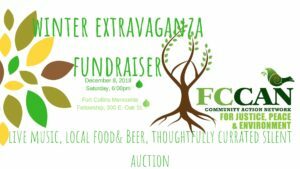 We are super excited to gather around some delicious local food, beers from Fort Collins breweries, live music from Tony Mihaly and a thoughtfully curated silent auction that highlights small, independent businesses in our community. $15 suggested donation- goes to support FCCAN’s community activism. 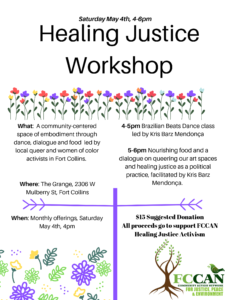 FCCAN is a local, grassroots organization comprised of five independent affiliate programs and projects: The Fort Collins Sustainability Group, Fuerza Latina, Barrier Busters/PTAG, The Fort Collins Homeless Coalition, and the Open Communities Collective. Find more info at the facebook event. Hope to see you there!